Where did 2014 go...? I can't believe it has been 12 months since I wrote about Oscar's medium weight Mark Todd rug that he lived in last Winter. I wrote about my anticipation of Winters arrival, it had happened "officially" but the cold never came, the month averaged out at 4.8 degrees celsius, frosts were few and far between and there was no sign of snow. 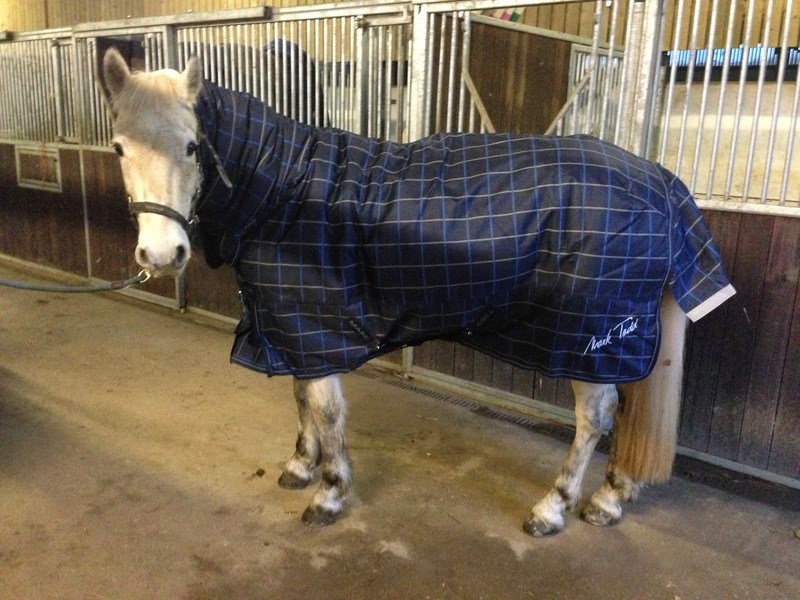 2014/2015 couldn't be more different...we even saw a white Christmas and this same week a year on, temperatures have struggled to get above 2 degrees celsuis most days, therefore out of storage it came, Oscar's heavy weight turnout rug. I love the fit of Mark Todd rugs and therefore purchased the same design as his medium weight but with increased filling, this cost £115.99 from Equestrian Clearance - I always find this website competitively priced. Outer; 1200 denier, made with waterproof and breathable rip-stop, Teflon coated polyester material. Gussets at the shoulder - all must haves for me, I find shoulder gussets allow more movement and rugs with these features are less likely to rub and although a heavy weight this rug hasn't caused rubs even on a fully clipped Oscar, plus the reflective strip on the tail flap is a great safety feature. Fastenings; twin buckles with quick release clips on the chest - again another must have for me - Mark Todd rugs ticks so many boxes! Velcro and twin buckles on the neck, low crossing adjustable surcingles across the belly and removable/adjustable webbing legs straps, which I always use! As I documented in my previous blog these are helpful for a spooky pony and secure the rug in place and reduce the risk of it slipping after a good old roll around! Inside; 350g filling with a soft nylon lining and fleece poll protection and Oscar is always dry, cosy and warm underneath! The rug has rubbed Oscar's mane a little but this is inevitable, I find rugs with built in necks rub less than neck-less or attachable neck rugs though and once these season is over when it's time for rugs to be cleaned and packed away I am going to sew lycra into the neck area as I have read doing so can avoid rugs from rubbing away the mane, along with generous lashings of mane and tail conditioner - watch this space for a post in 2016 on whether it worked. The only positive of all this cold...it's frozen the paddock entrance equalling less mud!! !